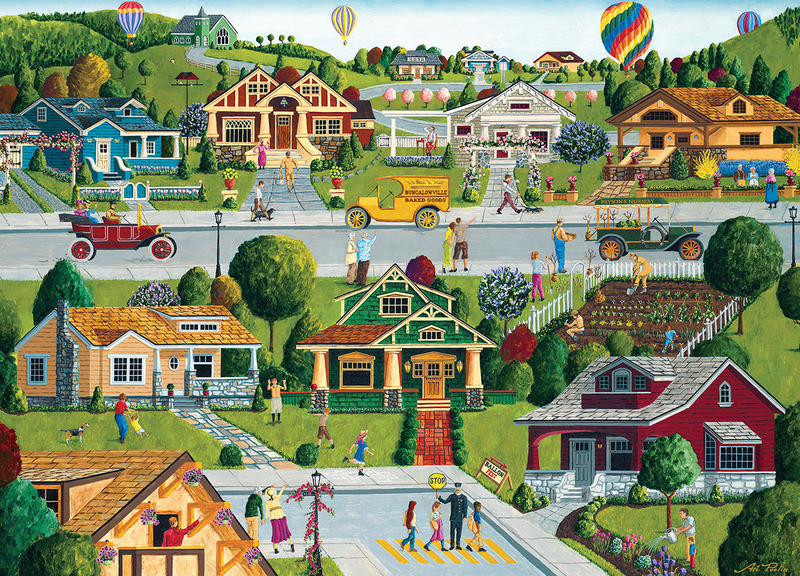 These MasterPieces 19.25" x 26.75" 1000pc Hometown Gallery Puzzles are painted by the talented folk artist, Art Poulin, and they feature beautiful, vintage scenes that remind us all of simpler times. Considered one of America's foremost folk artists, Art Poulin paints timeless canvases of inviting landscapes. On top of being an incredibly talented folk artist, Art also served in the US Army for 27 years, and is a classical pianist. With their timeless beauty, these puzzles are sure to offer you an afternoon of puzzling fun! To reduce their impact on our environment, the chipboard used in these puzzles is made of recycled material. I have become over the years a Wysocki follower, but in my older years I have found that I continue to need and enjoy the challenge of puzzle working. I have always enjoyed reading but often forget where I am. Working puzzles doesn't require remembering where you were, but offers a challenge to your thinking. One thing I will say about this puzzle I am still working is that the cut seems to be more of a challenge than the older puzzles and hence requires a little more diligent thinking which is good for me and more of a challenge. Yes, I would recommend Puzzle Warehouse to a friend. Fun puzzle to put together. Very colorful. I enjoyed this puzzle, though I am not sure of the time period of the puzzle as the people are dressed in different eras. I know this is just a small quibble, but when I do the puzzle I like to absorb the time period. The pieces where well cut, excellent really and shiny, not matte. There are tons of details in this puzzle. Plan on a challenge. Love this puzzle. It's gonna be hard but a lot of fun! YOUR PUZZLES ARE GREAT AND YOUR BASEBALL STADIUM PUZZLES ARE AMAZING.THE GREATEST PLACE TO BUY JIGSAW PUZZLES.THE BUNGALOW PUZZLE IS AMAZING.GREAT CHOICE IN PUZZLES.I ORDER MORE PUZZLES YOU ARE THE BEST.THANK YOU VERY MUCH. I don't personally do the puzzles I donate them to nursing homes and they mostly like the Charlals Wysoky and hometown puzzles.They get a big kick out of them. I am just starting this puzzle and so far its going good.